Why do you think the curators included it in the exhibition? The curators chose to include fairy tale in their exhibition to educate and examine fairy tale for a high fashion lens. The fairy tales ranged from authors such as Hans Christian Anderson, Brothers Grimm, and Charles Perrault, which were all worldwide known authors and fairy tales addressing people on a global scale. In this exhibition, dress was used to visualize “characters transformation, vanity, power, and privilege”(Fairy Tale Fashion, Fashion Institute of Technology). For the future, I wish though we could examine more unknown fairytales, authors and stories, which could be also better fit into the time period we live in now. I am thinking of Goethe or Oscar Wild which were famous authors too but their stories such as Faust or the Picture of Dorian Grey reflect the society today in a much better light. Meaning that, I see in society that western man who is in conflict making decisions, decisions what he wants to fight for, if he wants to fight for, love or consume, and is in conflict with is inner soul because he doesn’t know what he wants, what his destiny is, because we live in a very fortuned, wealthy society. 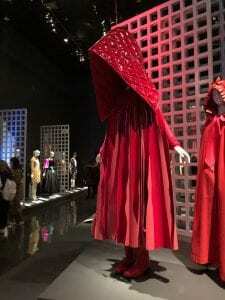 Coming back to the FIT fairy tale exhibition I was particularly drawn to Comme de Garcons 2014 interpretation of “Little Red Riding Hood”, which was presented in the middle of a dark, high sealed room with dramatic lighting. That helped the viewer to draw his focus into the story of the garment. My eye just was drawn into the flow of red, an alarming color, my color, the giant hood, and the paneled airy dress. It was just a statement the designer and the curator made in the room, where no words need to explain the story. What contribution does it make to our collective understanding of fashion history and fashion place in the museum setting? 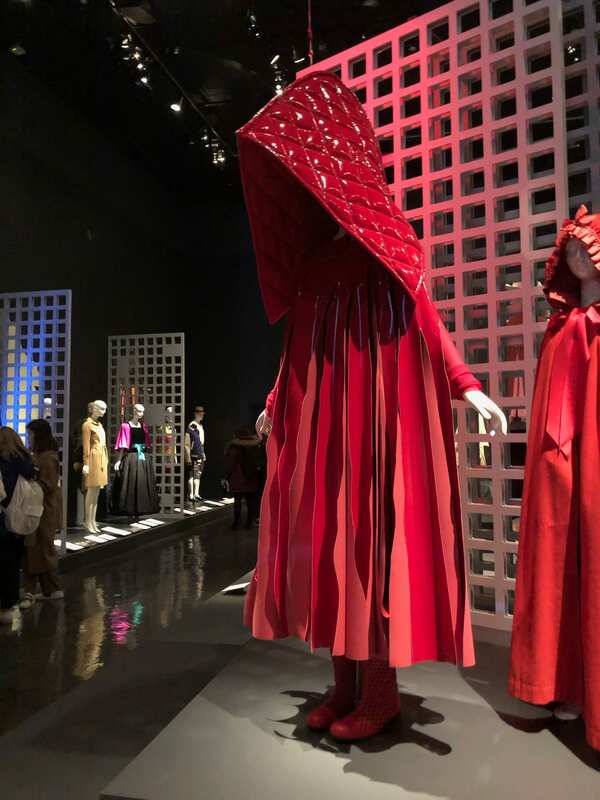 The curator selected famous designers/design house across the globe to help curate the fairy tale exhibition (designers like Rei Kawakubo Alexander McQueen, Dolce and Gabbana, Walter Van Beirendonck, Rick Owens, Tom Ford etc. ), which shows how known and popular these romantic fairy tales are across nationalities all viewed and understood in slightly different way, which is expressed in their garments, they details the designers wanted to highlight or not to help explain the story. In the case of the “Little Red Riding Hood”, I found it very interesting that Rei Kawakubo decided to blow up the shape of the hood, which symbolizes to me that innocent girl that is hiding underneath her hood also a kind of cuteness is also associated with override clothing on girls, which helps us to understand what values Japanese designers wants to protect or celebrate about their character/ interpretation of the fairy tales character. I also could see a German designer putting emphasize on the dress/ apron skirt of the “Little Red Riding Hood” because our culture celebrates these garments a lot in traditional items of clothing such as the Drindl. In other words, through having a range of designers from different nationalities is interesting to see learn about their culture with just their dress practice and details they value in their dress practices. Therefore the museum setting was very successful in delivering us this story without words to be added to explain for a fashion expert/ lover. Perhaps for an outsider, the exhibition would have been a bit more difficult to understand the significance of the garments because not everyone shares the same love for high fashion garments and their significance in fashion history/their existence. For me, high fashion pieces such as the “Little Red Riding Hood” are the pieces that make a statement about one’s culture, values, identity. The POP of COLOR!! “Fairy Tale Fashion.” Fairy Tale Fashion | Fashion Institute of Technology. Accessed April 13, 2019. http://www.fitnyc.edu/museum/exhibitions/fairy-tale-fashion.php.